Rocky planets like Mars and Earth have formed during the early stages of our Solar System by acquiring their mass through collisions of planetesimals and protoplanets. Such energetic collisions, as well as the decay of radioactive heat producing elements and the process of core formation, produce a large amount of heat that has been stored in the planetary interior. This heat is efficiently transported by convection in the rocky mantle, which on timescales of millions of years behaves similarly to the boiling water in a pot on the stove, and is eventually lost to space through the planet’s surface. The surface heat flow (the way a planet loses its interior heat) can be used as an indicator of the amount of heat producing elements in the interior and can be directly linked to the planet’s composition, placing important constraints on the planetary formation models. Because of their complexity, however, direct surface heat flow measurements on terrestrial planets other than the Earth are sparse and only available for the Moon. But this will change with the upcoming NASA mission InSight (Interior Exploration using Seismic Investigations, Geodesy and Heat Transport). The InSight mission is scheduled to launch next year in May from Vandenberg Air Force Base in California. It will reach Mars after a six-month journey on November 26th, 2018 and will perform the most comprehensive surface-based geophysical investigation yet of the red planet. 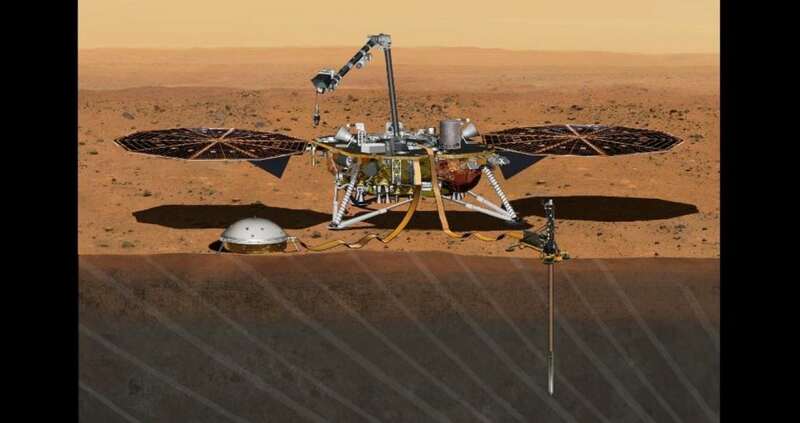 The InSight lander will place a seismometer on the surface of Mars and drill a heat flow probe five meters down, in the Elysium Planitia region near the planet’s equator. It will monitor the seismic activity of the planet, the rate at which Mars loses its interior heat as well as accurately determine the rotation of Mars by using the lander’s communication system over the course of one Martian year (two Earth years). The HP3 (Heat Flow and Physical Properties Package) instrument onboard InSight, developed at the German Aerospace Center (DLR), uses a hammering mechanism that will place temperature sensors below the surface of Mars and will record the rate at which heat escapes from the interior of the planet. Such extremely valuable measurements will advance our understanding of how the interiors of terrestrial planets work and constrain their evolution from the early stages of planetary formation until the present day. Although about two times smaller and ten times less massive than the Earth, Mars, like the Earth, has experienced the differentiation into a rocky crust and mantle, and an iron-rich core. Like the Earth, Mars has volcanoes, in fact, it possesses the most spectacular volcanoes in the Solar System, and also like the Earth, Mars has a north and a south pole covered by ice. But while on Earth the caps consist of water ice, on Mars they are made of a combination of water ice and carbon dioxide ice. Nevertheless, because throughout its evolution, Mars was less geologically active than the Earth (e.g., it does not have plate tectonics) it may have retained a complete history of the earliest processes that shaped its interior. In the absence of direct heat flow measurements, the Martian surface heat flow is estimated from measurements of the bending of the lithosphere, i.e., the rigid outermost part of the mantle, under the load of large volcanic constructs and polar ice caps, similar to a jello pudding deforming under the weight of a cookie on top. The base of the part of the lithosphere that behaves elastically and bends under this load can be approximated by a characteristic temperature. The depth of the elastic lithosphere and its corresponding temperature together with assumptions and estimates of the thermal conductivity and the distribution of radioactive heat producing elements in the crust and mantle can provide a heat flow value. Nevertheless, uncertainties arise because large volcanic centers have been built over millions and billions of years, and the only reliable present-day elastic thickness estimates are those obtained at the North and South poles of Mars from the deflection of the lithosphere below the ice caps. However, the North pole estimate of the elastic thickness shows a value larger than 300 km, which cannot be reconciled with numerical studies of Mars’ interior evolution. It has been argued that either such a value cannot be globally representative or the interior of Mars contains far less radioactive heat producing elements than predicted by various planetary formation scenarios. The HP3instrument onboard InSight will test which of the above hypotheses is true by performing the first direct measurement of the present-day heat flow of Mars in the Elysium Planitia region. Since InSight measurements will be performed at a single location on the surface of Mars, some help is needed to interpret them in a global context. With the extraordinary increase of computational power over the past decades’ numerical simulations of mantle convection and planetary evolution have become a powerful tool to model complex physical processes, that are active in the interior of terrestrial bodies across our Solar System and beyond. Such large-scale numerical simulations are performed at dedicated supercomputer centers and run with hundreds or thousands of computational cores in parallel. Numerical simulations of mantle convection investigating the interior evolution of Mars and performed at the DLR Institute of Planetary Research have been used to assess the spatial variations of surface heat flow caused by mantle plumes. Mantle plumes are hot thermal anomalies that typically originate at the core-mantle boundary and are believed to be responsible for the youngest volcanic activity on Mars in Tharsis and Elysium provinces. These thermal anomalies, however, could affect the heat flow measurement if they are located in the proximity of the InSight landing site making the average surface heat flow difficult to reconstruct. We have carried out a variety of numerical simulations of the interior evolution of Mars spanning a large set of parameters. All simulations employ crustal thickness variations compatible with gravity and topography data. 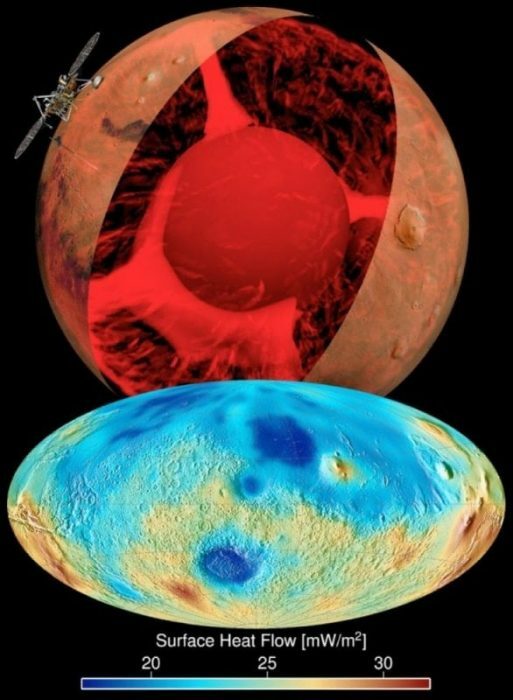 The slight variations in the gravitational field experienced by orbiters flying around Mars combined with topographical data obtained by the Mars Orbiter Laser Altimeter instrument onboard Mars Global Surveyor can be used to derive crustal thickness maps. Crustal material has an elevated content of radioactive heat producing elements compared to the mantle material because these elements are extracted from the interior upon melting and enriched in the crust. Our numerical simulations match the present-day surface abundance of radiogenic elements measured by the gamma-ray spectrometer onboard the Mars Odyssey spacecraft and represent to date the most detailed simulations of the present-day interior of Mars. The numerical results show that mantle plumes are unlikely to affect the heat flow measurements because such thermal anomalies are found to remain confined to some geological provinces like the large volcanic centers Tharsis and Elysium and at a considerable distance from the InSight landing site. Our models show that the surface heat flow value obtained at InSight location is very similar to the average surface heat flow suggesting that InSight would return a representative heat flow measurement for present-day Mars. Moreover, the presence of mantle plumes can introduce large variations of the elastic lithosphere thickness and allow to reconcile numerical models of interior evolution with the North-pole elastic thickness estimate. The lunar heat flow and seismic measurements, carried out by astronauts during the Apollo missions, have greatly improved our understanding of the interior of the Moon. The upcoming InSight mission will perform its measurements autonomously on the surface of Mars and return valuable data that will help us understand the formation and evolution of Mars and other terrestrial planets. Plesa, A.-C., M. Grott, N. Tosi, D. Breuer, T. Spohn, and M. A. Wieczorek (2016), How large are present-day heat flux variations across the surface of Mars?, J. Geophys. Res. Planets, 121, 2386–2403, doi:10.1002/2016JE005126. This study How large are present-day heat flux variations across the surface of Mars? was recently published in the Journal of Geophysical Research: Planets. Ana-Catalina holds a postdoctoral position at the German Aerospace Center (DLR), Department of Planetary Physics.